Last Game: Sunday in Hershey, the Penguins came back from a two goal deficit to force overtime and beat the Bears 6-5 in overtime. Will O’Neill scored the game winning overtime goal and was a +3 in the game and was named first star. For Binghamton, the B-Sens were in Utica Sunday and beat the Comets 3-2 in a shootout. Matt O’Connor stopped 46 of 48 shots and was named first star of the game for the Senators. Last Meeting: January 5 in Wilkes-Barre, the Penguins won 4-1. Dominik Uher scored two goals and Matt Murray stopped 32 of 33. Why you should care: Despite their last place showing, the B-Sens come into tonights contest winners of their last four games and have taken points in their last six games. 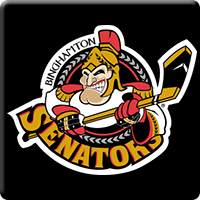 Far out of serious playoff discussion, the Binghamton Senators are not an easy point grab. The Penguins will need to match the same intensity they had against Hershey Friday and Saturday if they want to walk away winners tonight. Other Game to Watch: Hershey visits Lehigh Valley in a game that bears keeping a close eye on.